Stewart Lee has been to the ‘conurbation’ twice in the past year. I saw him at the Bournemouth Pavilion last year and the Poole Lighthouse last Thursday 2 March 2017. As a speechwriter, comfortable with the Liberal Metropolitan elite, I enjoy watching him in action. He’d come to Brexit territory, so I admired the vehemence he used in attacking the Brexiteers. The audience seemed to love it, although there wasn’t a greyhead in evidence, (the kind of people who usually go to see the Bournemouth Symphony Orchestra in the same theatre). There’s a pre-recorded ‘voice of God’ that announces comedian Stewart Lee’s arrival on stage, along with some music. He abruptly interrupts that and begins his act. Both times he began with his house notices. He told us exactly how long each half will last, making some bits conditional on a good audience reaction. Then he goes into a routine about what he’ll do to anyone who starts filming him with a mobile phone. It’s graphic and disgusting – and we all laugh. As he does his material, he dissects the audience. He complains about the people at the back. And comments on the reactions of the people in different parts of the room. He verbally attacks anyone who moves from their seat. He dissects his own jokes. Telling the audience that they’re laughing in the wrong places. It’s a great example of speaking in ‘the here and now’. 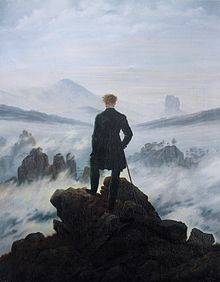 He ended his set in Poole by parodying the picture by Caspar David Friedrich, Wanderer above the Sea of Fog.